Student Blog – CHECK ME OUT! UT state standardized assessments (now called RISE and Aspire Plus) will be on the following days for our class. These assessments are important to us for several reasons. If you choose to opt your child out of testing, please complete the Parent Exclusion from State Assessments Form. This form must be handed from you to either Ms. Lana or Ms. René, who will take 5 minutes to review this form with you. We ask that these forms are submitted no later than April 12th. Thank you for your cooperation and support. We will be reading and promoting the love of reading all week. Chat with your student about their favorite books, poems, etc. Ask them every day what reading and writing activities they did and what they created. On Friday, we will be having a Read-A-Thon. I will get back to you about details! Have a great weekend. February & March have been and are so full of events and notifications for the whole school. I hope all are receiving the quick notes as things occur; let me know if you need to renew with our classroom Remind app. We had a great time the past few weeks working on mastery pieces for our portfolios and enjoying the variety of special events we’ve had. The Fun Run, Valentine’s party, and Spelling Bee just to name a few. This past Friday, I sent home a homework letter. These daily tasks are ten-twenty minutes long and serve multiple purposes. If you have any questions or request for alternatives, please let me know. We are in the home stretch to the end of school and need to really stay strong in moving our minds as far as we can; thank you for helping your child achieve this year! Tomorrow is the school wide Spelling Bee. We will be rooting for our students to all do well. Three students were chosen from our in-class spelling be to be our representatives in the school wide event. We are excited to see this tomorrow! Yearbooks can still be purchased for $20 right now, until March 1st; then they will be $25. Our school offers incredible field experiences for our students throughout the year. These experiences culminate in the 6th grade Redwoods trip and the 9th grade Crow Canyon trip. While students are asked to contribute towards the costs of these trips, their contributions only cover a portion of the actual costs. In order for our school to continue to provide amazing experiences for all of our students, we need your support through fundraising efforts! Please register your child on funrun.com tonight! The process is very simple and will only take a minute or two. Our class is having a blast preparing for the Maria Montessori Academy Fun Run coming up soon! We’ve also begun to learn how to solve problems using character through Boosterthon’s character theme, MindSpark Mystery Lab. While they’re teaming up with the MindSpark Kids to solve mysteries, your students will learn five 21st-century character traits that will help strengthen themselves and our world. Make sure to ask your students what they’ve learned each day, and together you can watch the story unfold on funrun.com! Remember, we need your help connecting to sponsors who can make a pledge to help our school! Please make sure all pledges for the Maria Montessori Academy Fun Run are entered on funrun.com. The more pledges we get, the more incentives our class earns on our Pledge-O-Meter. Thank you for your generosity and support of our school. If you have any questions, please let me know. 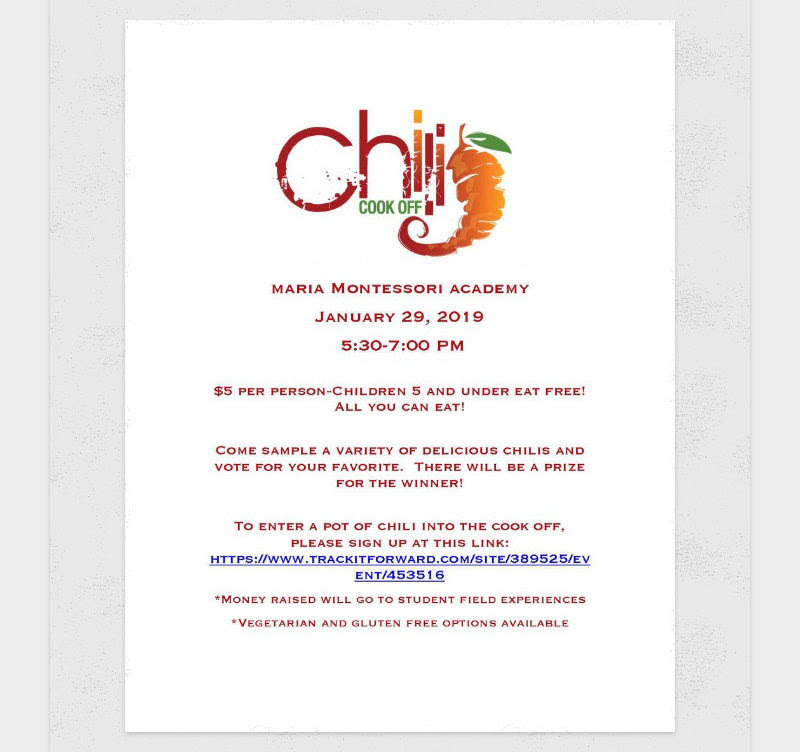 Please use this link for your 6th grade students to sign up if they are interested in volunteering at the Chili Cook Off. You can also sign up here if you would like to sign up to bring a pot of chili to the cook off. MMA is hosting a Fun Run (similar to the old Jump Rope for Hearts), meaning there is no selling or delivering products. Once our program begins next week on January 23rd, family and friends anywhere in the world can support our school by giving pledges toward the number of laps your students will run on the day of the Fun Run: February 1st. Our Fun Run also comes with a world-class character theme. This year’s theme is MINDSPARK MYSTERY LAB, combining S.T.E.A.M skills (Science, Technology, Engineering, Arts, and Math) with character-building – which is a beautiful follow-up to STEM week. While they’re teaming up with the MindSpark Kids to solve mysteries, our students will learn five 21st-century character traits that will help strengthen themselves and our world. Through this year’s Fun Run, our school goal is to raise $8,000 for field experiences, such as Redwoods and all other field trips. We need YOUR help! Teachers will give you more information next week. Brainstorm with your student to think of people to contact and promote this fundraiser. Then, help them register their pledges online when given the logins. We made it through STEM week and had a blast while doing it! This week all students participated in a variety of assemblies, experiments, and other activities to understand more about STEM and STEAM in their world. We have discussed a great deal how each letter in this acronym impacts our daily lives. Ask them about it and see what they can tell you. They also have been working on essays related to this topic. Ask them to share it with you, or if they don’t have as much done on it, help them work on it over the weekend. We have a new assistant! Ms. Emily has joined us now and has stepped right in to the mix to understand and help. She has previous experience working with children and in schools. Soon, you will be able to view her bio on the MMA website. As previously posted, students are now looking forward to the Spelling Bee and conferences in February. Letters went home and will come home again for the spelling bee and Parent-Teacher Conference sign-ups are ready on Track-it-Forward. This year, these conferences will be a Parent-Student format where parents will interact with their student and the student’s portfolios. Students will be showing and speaking about the things they have been learning and show/share some of their proudest moments. I will be present to assist and answer any other questions. Our students are making good progress in both reading and math. I am very pleased and think that they are as well. The DYAD reading we have been participating in and the extra time spent on their core math understandings are paying off. We will be continuing these two practices while building their grade level and above level skills in these areas. Looking forward to seeing you at the upcoming events! SCREENAGERS – Movie shown tomorrow! On January 10th from 6-7:30 PM, MMA will be screening the documentary SCREENAGERS for all interested parents, students and friends of the school in the Junior High commons area. SCREENAGERS – The average child in America spends more time consuming electronic media than going to school, with many teenagers going online “almost constantly.” In SCREENAGERS, physician and filmmaker Delaney takes a deeply personal approach as she probes into family life to explores parental struggles over social media, video games, academics and internet addiction. Through poignant and funny stories along with insights from authors, psychologists, and brain scientists, SCREENAGERS reveals how tech time impacts kids’ development and offers solutions on how adults can empower kids to best navigate the digital world and find balance. We are gearing up for our Annual Spelling Bee in February of this year. See the PDF below for this year’s words to practice! I have so enjoyed our week this week and I have heard so many wonderful compliments from the children that we have had a great week. I appreciate being in a school that respects the whole child and remembers that life requires more than academics. I felt so proud of our class for being so friendly and wanting to have a very large table to sit together and eat at lunch time. Many times through the year so far, I have witnessed how the students have created larger and larger circles to include each other. Granted, there will be times when friends need time apart and we honor that too. Yet, I loved the feeling in our classroom this week with the children coming together as a community and truly using those social skills well. I want to wish everyone a very happy holiday season and hope that each of you can enjoy it to its fullest. We will be very busy as soon as we return from break, so it is good to get a rest first! See the notes below for some reminders for the immediate weeks we return. Jan 3 Return to School! A WordPress Commenter on Hello, Classroom 1 – The Honey Locust Trees!